Join the hundreds of thousands of people in 135 countries worldwide who have used our award winning PDF Converter technology to save their time and increase productivity. Our PDF technology will help you: Recover and Reuse PDF in Word. Analyze PDF data in Excel, Create PDF from any printable Windows application. Investintech.com Inc. is a Canadian company, incorporated in the year 2000, and is the developer and publisher of powerful PDF creation and extraction software products, including Able2Extract and the Sonic PDF Creator. As a company, we are focused on providing our business and consumer customers with products that are easy to use and that deliver powerful results. We stand behind our products 100%. We are accountable, conscientious and we pride ourselves on delivering the best customer service in the business. Views and converts your PDFs into editable MS Word and Open Office Writer documents. (Based on Able2Extract’s PDF to Word conversion technology). Able2Doc 6.0 performs fast and accurate conversions to MS Word and Open Office Writer with columns, tables, headers, footers, graphics and layout reproduced just as they were in the original document. Maximum editability is ensured! Once converted into Word, PDF text can be edited and repurposed as required. Native PDF forms can be transferred and filed out as Word forms. Learn more about Able2Doc`s top new features. Able2Doc now works with the Open document format – Writer. Non-english users using Arabic, Cyrillic and Asian language characters can convert any document from PDF to Word. Get all the features of Able2Extract 7.0 plus the ability to convert image (scanned) PDFs with Able2Extract Professional. Need to Create Secure PDFs? Packed with features, our Sonic PDF Creator creates secure PDFs quickly and easily. Looking for PDF to Excel Conversion? Convert PDF to Word Easily! Just Open, Select and Convert your way to outstanding results. Top of the line PDF to Word Conversion Technology: The Able2Doc PDF to Word Converter delivers pinpoint PDF to Word conversions! The Able2Doc PDF to Word Converter specifically addresses the PDF to Word conversion needs of users that need to retain either the look and feel of the PDF document in Word or need to pull the raw text into a Word document for use in other files. PDF to Word conversions require different conversion outputs. Standard (Recommended) Option: This option lets users convert PDF to Word text directly onto a Word document page while retaining the graphics of the PDF. We recommend this option since it results in maximum editability while, at the same time, preserving the look and feel of the original PDF document. 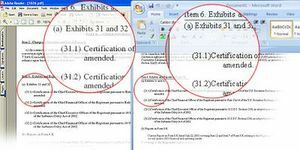 Frames Option: This option converts the PDF contents and graphics into Word but places the text into text boxes within word. Text Only Option: This option only converts the text of the PDF into Word. This is the simplest of the options and does not attempt to convert the background graphics of the PDF into Word. Users also have the option to designate what type of destination conversion they would like from their PDF. The options are an MS Word document (.DOC) and Rich Text Format document (.RTF). The conversion outputs are essentially the same. However, depending on the size of the PDF, the size of the conversion can vary. The Able2Doc PDF to Word Converter has a very simple and straightforward user interface to facilitate quick and simple PDF to Word conversion. Below is a list of some of the Able2Doc PDF to Word Converter features. PDF to Word conversion that has the ability to handle scanned PDF's (available in Able2Doc Professional). 3 different PDF to Word conversion options are available. The conversion options vary in complexity. Conversion options preserve the originality of the converted PDF to Word by identifying paragraphs, text labels, graphics, tables, and flow of columns etc. and then replicating it within Microsoft Word. Simple conversion - converts text from the PDF to Word document without the graphics. PDF to Word variety – convert PDF to Rich Text Format (RTF) or to Word, it is up to you! The PDF to RTF feature allows users to convert large documents faster than the PDF to Word option. PDF to Word Efficiency and Selectivity. Pinpoint selection ability. Since you can see what you select, there is no need to transfer whole documents or even whole pages at a time. Take one line of text if you want! The PDF to Word conversion size options – Convert the whole document, a range of pages, one page or a portion of a page – it is your choice! Convert PDF to Word and the output supports most Windows and Office platforms - 98/ME/NT/2000/XPIn addition, our proprietary PDF viewer is included the Able2Doc PDF to Word Converter so you can see what you are converting from PDF to Word! All the features of Able2Doc 6 plus the ability to extract text from scanned and image PDFs using OCR technology and convert into Word. Able2Doc Professional delivers all the PDF to Word conversion capabilities of Able2Doc 6.0 and adds the ability to convert text from scanned PDFs and image PDFs into easily editable Word documents. Able2Doc Professional adds scanned (image) PDF conversion capabilities to the Able2Doc6.0feature set. For users working with documents that are paper based and need to be scanned or, have already been saved as image PDFs, Able2Doc Professional is the choice.. Convert Image (scanned) PDFs into editable Word. Learn more about Able2Doc Professional`s top new features. Able2Doc Professional now works with the Open document format – Writer. Looking to add PDF to Excel Conversion as well? Our Able2Extract 7.0 and Able2Extract Professional are our best selling conversion products. It delivers PDF to Word, Excel and 8 other conversion options. Packed with features, our Sonic PDF Creator creates secure PDFs quickly and easily and comes with lots of editing features. Compare our Desktop PDF products to see which one is best for you. Views and converts your PDFs into formatted Excel spreadsheets, editable Word documents, PowerPoint presentations, Publisher, Autocad drawings and more. Get quick, accurate, transfer of native PDFs into formatted MS Excel spreadsheets and editable MS Word for editing, analysis and other reversioning. Conversion from PDF to PowerPoint (PPT), AutoCad (DWG), Publisher (PUB) and more is included. Once converted into Word or PowerPoint, PDF text can be edited and repurposed as required. Tabular data in PDF becomes accessible and formatted in an Excel spreadsheet. Column structure is preserved in Excel. The look and feel of the PDF is replicated in Word. Fillable form fields in PDF became useable in Word. Learn more here about its new features. Working with product or building plans? Take your PDF to DWG/DXF. Convert more files, faster with Able2Extract’s batch conversion feature. Convert PDF to Microsoft Office Publisher, the desktop publisher included in Microsoft Office. Only Looking for PDF to Word Conversion? Our Able2Doc software is based on the Able2Extract PDF to Word technology platform. All the features of Able2Extract 7 plus the ability to convert text from scanned and image PDFs into Excel, Word, PowerPoint, Publisher and Autocad using advanced OCR technology. Enjoy all the features of Able2Extract version 7.0 PLUS the ability to convert text from scanned and image PDFs into Excel, Word, PowerPoint, and more using leading edge conversion and OCR technology. PDF to Autocad, PDF to Publisher and XPS conversions are also included. Convert Image (scanned) PDFs into editable Word and formatted Excel. "... The time saved by using Able2Extract over manual data entry, when translated into hours per year, runs well over a thousand hours and, as we all know, time is money, not to mention avoiding time spent error-trapping erroneous data that would otherwise be manually entered"
Learn more about its top new features. Convert more files, faster with our new batch conversion feature. Our Able2Doc software is based on the Able2Extract conversion technology but only converts from PDF to Word. Investintech.com knows that there is nothing better than Free tools that help you become more productive and get the job done faster. Here’s five we currently offer: Add us on Twitter and Facebook to get updates on new tools as we release them. The only Bloatware Free PDF Reader available today that is completely secure. Slim PDF Reader uses Able2Extract’s stable PDF viewing technology to offer a high quality PDF Reader that is only 1.5MB in size. Compare that the 32MB download from Adobe or the 7MB from Foxit. Slim is fast to use because of its size and it is not subject to all the security flaws of Adobe. Download it Now!